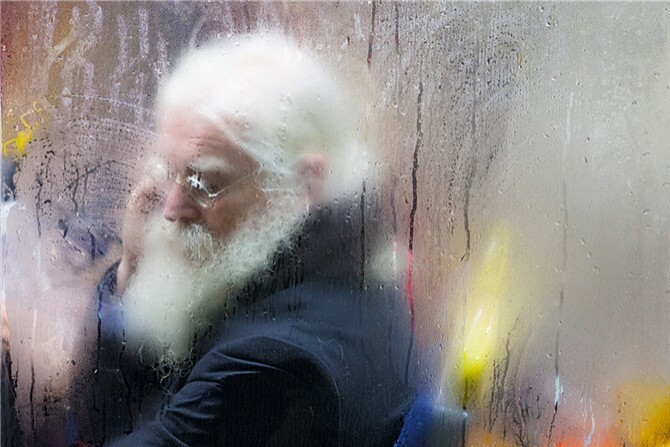 Taken over the course of three winters in London’s Elephant and Castle, street photographer Nick Turpin’s “Through a Glass Darkly” series explores privacy and voyeurism in the public sphere. 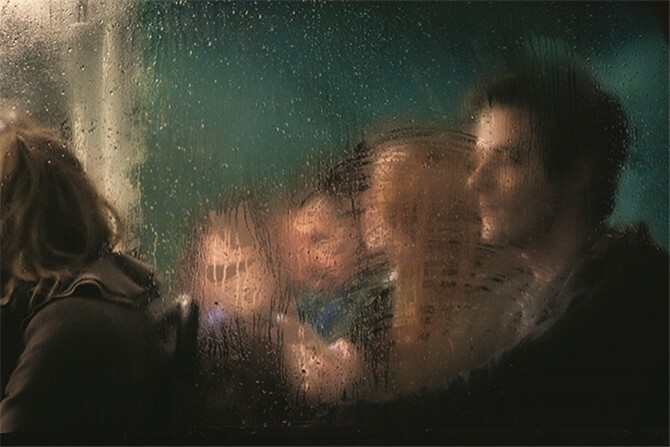 Using a raised platform, with a long lens set at 1/40th second creating a slightly blurred effect, Turpin captures London commuters at their most unguarded, during what he calls “that strange time between leaving the office and arriving home when you are between two identities”. The drunkenness, the rough sleeping, the anger and the upset, do not feature. Rather, there is an elegant, painterly quality to the work. The setting, a weary place of carpeted seats and bumpy roads, here appears contemplative and calm. On occasion, passengers stare directly down the lens of the camera, but more often they are lost in thought or nodding sleep as heads rest in hands and hands cover eyes. 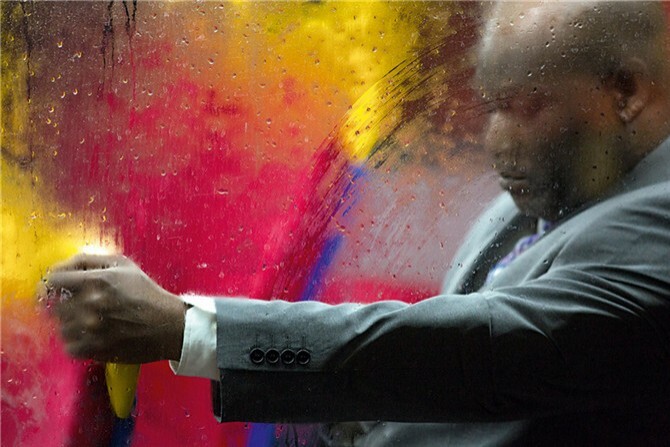 Bursts of primary colour—a yellow handrail, a blue seat—break up the dreary grey of the London night, and steamed windows soften features into smudges like strokes across a canvas. The camera clicks, the commute continues. The night bus empties and refills and the day begins again. 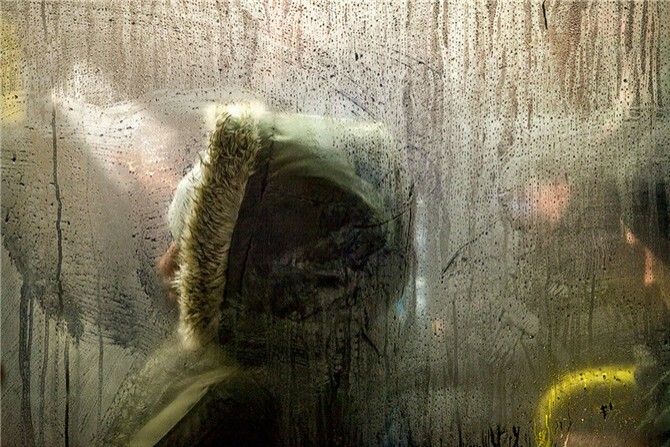 Turpin’s camera sees the world as we do, each night, on our own long journeys home; glimpses of lives unknown seen only briefly through fogged windows. In The Dark Of NightWhen the night falls, there’s always a sense of mystery that comes along with it. Reality as we know it in bright daylight takes a break. Into the darkYour adventures do not stop when the sun goes down, and your photography should not have to, either.